Originally conceived as a testbed satellite to prove the advanced designs for future U.S. government spacecraft, the NPP mission blasting off Friday has been thrust to an entirely new level of importance for meteorologists now facing a gap in data from space. Its NPP name once stood for the NPOESS Preparatory Project, a fitting description as the trailblazer for the National Polar-orbiting Operational Environmental Satellite System (NPOESS) that aimed to combine the civilian and U.S. military weather spacecraft into a single program. The Clinton Administration started the NPOESS effort in 1994 to merge the polar weather satellite projects by NOAA and the Defense Department into one program using shared spacecraft outfitted with advanced instruments. But NPOESS was besieged by an ineffective management structure, money woes and long delays, ultimately leading to the outright cancellation last year. The civil and military weather programs were instructed to go their separate ways in developing the next fleets of satellites, which won't be ready to fly for several years. "Back in February 2010, the administration decided to restructure the NPOESS program and break the program up into two -- one with the Air Force handling the early-morning orbit and NOAA handling the afternoon orbit," said Andrew Carson, the NPP program executive. Those orbit times are indicative of when a satellite passes over the equator, enabling the two constellations to capture different observations for meteorologists to feed into forecast predictions. The Pentagon still has a couple of its heritage spacecraft sitting in the hangar awaiting launch to replenish the orbiting network as needed. But NOAA and the civilian system put up its final current-generation bird two-and-a-half years ago, meaning the NPP satellite, sitting on the launch pad, is no longer viewed as just an experimental platform. Now, it must supply meteorologists with the observations needed for weather forecasting over the next several years until the revamped civilian satellite program can take root. After NPOESS was dissolved last year, NOAA and NASA began working together to create the Joint Polar Satellite System, or JPSS, that would be ready to launch by 2016 when NPP reaches the expected end of its useful life, and Ball Aerospace started building a clone of NPP as the first JPSS spacecraft. But JPSS has received less funding in the federal budget than the White House requested, already slowing the development schedule and delaying the JPSS 1 launch to 2017 or 2018. 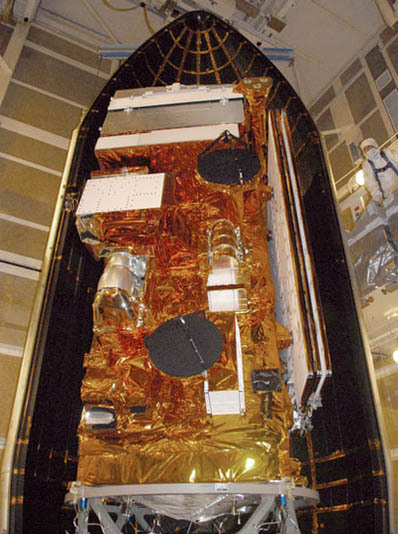 "Polar-orbiting satellites have about a five-year lifespan, and we launched our last one -- NOAA 19 -- in early 2009. As a result of the funding shortfall and the fact that NOAA 19 is well into its operational mission, there will be a near-certain gap in coverage from the crucial afternoon orbit once NPP finishes its operational life and the operational readiness of the first JPSS satellite, which is currently scheduled for launch in the first quarter of Fiscal Year '17," said Mary Kicza, NOAA assistant administrator for satellite and information services. Since it is expected to take 18 months to check out and calibrate NPP's modernized measurements, the agencies want to get NPP launched now so that its original intent -- testing the upgraded instruments -- can be performed to uncover problems that would need fixed before the sensors are used on JPSS 1. "It is important to note that NPP will test how these instruments perform before we commit them to flight on the JPSS satellites," Kicza said. "It was always envisioned that it would take approximately 18 months to go through the calibration/validation of these instruments, and that would give NOAA time to update the data product algorithms for use on the ground so that we can improve the data products before the operational system would be launched," said Ken Schwer, NPP project manager from NASA's Goddard Space Flight Center. There is no guarantee that NPP can last until JPSS 1 launches into space, no matter when it gets up there. In fact, officials caution that the NPP mission lifespan is suspect even before reaching orbit. "It's always hard to predict how long a satellite is going to live. I can tell you the instruments were designed under the NPOESS regime for a 7-year lifetime. However, during manufacturing, testing and calibration of these instruments, significant anomalies arose that give us concern that there's residual risk with these instruments that could actually affect the on-orbit lifetime," Schwer said. "The instruments are performing well, but we are concerned about the on-orbit lifetime with some of these instruments. Keep in mind, NPP was always a pathfinder mission and the lessons learned from NPP were going to go back into the design and manufacturing of these instruments for the follow-on operational program." Despite the uncertainty about how long the data will flow, users of the NPP information are eager to see what the advanced instruments can produce. "NPP brings the promise of superior short-term and long-term weather and climate forecasts, which inform daily activities of everyone -- from decision makers who protect the nation's safety and economic security to industries that power the nation's economic engine," Jack Hayes, director of the National Weather Service. "While NOAA forecasters do a great job alerting the nation to these major weather threats, we'll do an even better job with improved global data from NPP instruments updating our models."